Although some people would never consider sharing their home with a pig, pot-bellied pigs are quite charming and appealing. There is no doubt that when given the proper care and training, a pot-bellied pig can make an interesting and much-loved addition to the home. However, many people find that pigs are demanding pets and are overwhelmed by their needs. Care difficulty: Intermediate. Pigs are smart, and as a pet, a pot-bellied pig requires a patient owner willing to spend time on discipline and behavior modification. Pot-bellied pigs will live an average of 12 to 18 years, with some getting to be older than 20 years. Responsibility for their care (with respect to both time and finances) is not to be taken lightly. Another problem some owners have encountered with their pigs is aggression. Pot-bellied pigs can be territorial and have the drive to be dominant. Unless shown that the human in the household is the "alpha," pigs can exhibit a form of aggression known as dominance aggression (also seen in dogs). Pigs need to be taught to respect their owners by having rules and boundaries set, learning the word "no," and being subject to gentle but firm discipline. Like dogs, pigs respond well to positive reinforcement (e.g. using praise and treats when the pig is doing something desirable) but do not do well at all with physical punishment. From day one, the owner should be setting the rules and enforcing them. Consistent rules, praise for good behavior, and correction/redirection with lots of repetition and patience will help produce a well-mannered pot-bellied pig with a good relationship with its family. And like pet dogs and cats, neutering or spaying is a must with pet pigs, to control those raging hormones. Potty train your pig to use a litter box or go outside. Use praise rather than treats as a reward. Give your pig a space of its own, such as a tent or sleeping box. Pigs can be territorial but are most content when they have their own personal space. Be sure to provide an indoor rooting box so it can move rocks around. Rooting is a natural instinct in pigs. A rooting box is a good place to put a treat or to place some of the pig’s chow (see more about rooting in the section on what to feed your pot-bellied pig). Since pigs are smart and curious, you’ll want to pig-proof any areas of your house where the pig will have access, much like you’d baby-proof a home for a toddler. Cover electrical sockets, make sure steps are off-limits and secured, and remove tripping hazards like cords and rugs. Your pig needs exercise to prevent constipation, and regular access to the outdoors for exercise is a necessity. Pigs are unrelenting in their quest for food. They can learn to open the fridge, cupboards, and pantry—anywhere they think food may be lurking. They can become demanding, begging for food, and even getting aggressive with kids that have food. Pigs also "root" or dig/explore with their snouts and in doing so may overturn items in the house, including wastebaskets, and can disrupt the landscaping outside. You should provide an area of dirt outside for rooting, scattering your pig's food so the animal can search for it. Rooting in the dirt is also a source of minerals such as iron and selenium for your pig. The adult diet should include pig pellets that are low protein, low fat, and high fiber. Plan on about 1/2 cup per 25 pounds or 2 cups per day for adults. Fresh, non-starchy vegetables should make up 25 percent of the pig’s total daily diet. You also can provide alfalfa hay or bran for fiber, and many veterinarians recommend giving a captive pig a multi-vitamin. One children's chewable vitamin daily should be sufficient. Pigs are easily overfed and many are obese when fully grown. A fat roll over your pig's eyes indicates your pet is overweight and you should discuss diet with your vet. Don't feed your pig fatty or salty foods and don't give it table scraps, dog food, or cat food. If your pig stops eating, it is a sign that something is wrong and you need to take it to the vet. Pigs only sweat through the snout, so it will be wet if the animal is overheated. A pig's normal rectal temperature is 99.3 degrees Fahrenheit. And while most pigs are prone to sunburn, since most pot-bellied pigs are black or darker-skinned, this is less of a concern. Regular hoof trims are needed throughout a pig’s lifetime to prevent foot problems. One of the most common ailments in pot-bellied pigs is mange, which is a skin condition caused by mites. Pigs get dry, scaly, and itchy skin when afflicted with mange, and this condition usually requires treatment by a veterinarian. The other big health issues for pot-bellied pigs are weight-related: obesity and arthritis. An overweight pig can develop difficulty walking and have pain in its joints. Having your pet treated by a veterinarian who specializes in pot-bellied pigs will help keep its diet and weight on track. 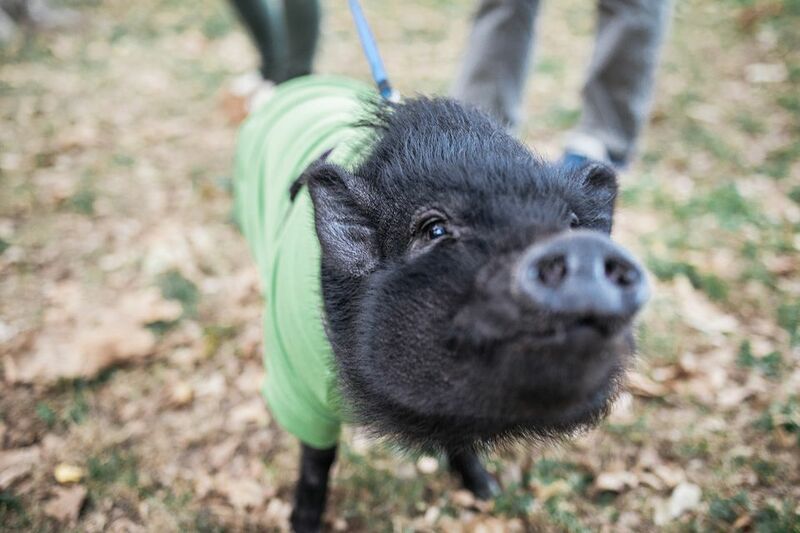 Pot-bellied pigs should be obtained from conscientious and reputable breeders, and as with any other exotic pet, you need to check local regulations to make sure pot-bellied pig ownership is permissible where you live. Some places classify pigs as livestock, not as pets, requiring special considerations such as enclosures. Other places will allow pigs of a certain size to be kept as pets, provided they are kept on leashes or otherwise restrained. Pot-bellied pigs, Vietnamese pot-bellied pigs, and Chinese pot-bellied pigs grow to a range from 125 pounds to over 200 pounds and 16 to 26 inches tall. Some breeders also use this range for miniature pot-bellied pigs. Miniature pot-bellied pigs (as designated by certain breeders) reach 35 to 60 pounds. and 15 to 16 inches tall. Teacup pot-bellied pigs are usually 35 to 45 pounds and 14 1/2 inches tall. Toy pot-bellied pigs reach 35 to 40 pounds and 14 inches tall. Royal Dandies grow to about 29 to 39 pounds and about 15 inches tall. Micro Mini Pigs grow to 18 to 30 pounds and 10 to 12 1/2 inches tall. Dandie Extremes grow to about 12 to 29 pounds and about 12 inches tall. Mini Julianas grow to 15 to 28 pounds, and 8 to 12 1/2 inches tall. It is also possible to be misled by unscrupulous breeders who breed pigs before they are fully mature and at full weight, claiming the offspring will be the parents' size at maturity. Here are some other options you may want to consider if you're not sold on the idea of having a pig around the house, but want a smart, enjoyable pet. Otherwise, check out these other exotic animals to find your next pet.